Signed: Case, dial, movement, and buckle signed. One of the most celebrated automatic movements of modern watchmaking, the name “El Primero” refers to both the movement (translating to “the first” in Spanish) and the line of watches Zenith debuted featuring this movement. Launched in 1969, the El Primero caliber was simply revolutionary. It was one of the very first automatic chronograph movements ever created, and furthermore, it was designed as a wholly integrated chronograph movement rather than being an automatic movement with an added chronograph module. Additionally, it operates at 36,000 VPH, an astoundingly high frequency for a mechanical watch, ensuring superior timekeeping performance. The story of the El Primero is not only a study in mechanical engineering, but is also fraught with drama: the equipment to produce the El Primero was condemned during the Quartz Crisis of the 1970s and set to be destroyed, but was heroically rescued by one Charles Vermot who had covertly hidden the equipment in an attic. When Zenith won the contract to produce the ébauche for the upcoming automatic Daytona based on the existence of leftover assembled movements, Vermot was instrumental in the re-uncovering of the methods to produce the El Primero. 2,600 examples were produced of this specific reference A384, yet it is safe to assume that few of them have been preserved in this truly “New Old Stock” condition. The case is razor sharp and the tropicalization of the subdials and tachymeter track is endemic in this reference, and can span the color spectrum from close to the original black to a light brown cappuccino hue. This particular example displays a beautifully even dark chocolate color, with the outer tachymeter track perfectly complementing the color of the subdials, and both set off by the impeccably preserved matte white dial. With a full complement of original accessories, this is a unique opportunity to own a relic of horological history. Since Zenith's beginnings, founder George Favre-Jacot sought to manufacture precision timepieces, realizing quality control was best maintained when production was housed under one roof. Zenith remains one of the few Swiss manufacturers to produce their own in-house movements to this day. Today, the brand is best known for the "El Primero," the firm's most successful automatic chronograph movement. In an interesting twist of fate, the company that owned Zenith during the 1970s decided to move on to quartz movements and therefore sought to destroy the parts and tools necessary to make mechanical movements. One watchmaker realized this folly and hid the tools and parts before they were destroyed. 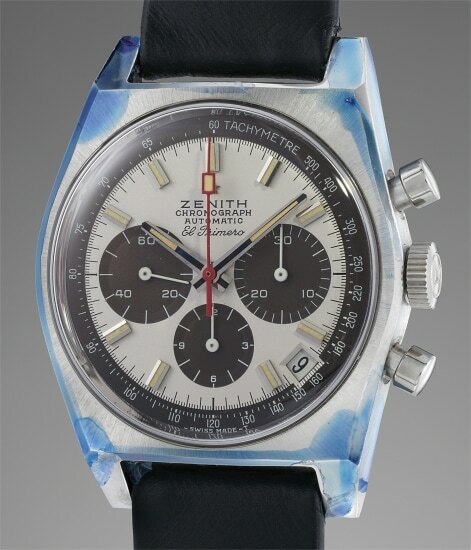 In 1984, he returned them to Zenith so they could once again make the El Primero movement. Case, dial, movement, and buckle signed.